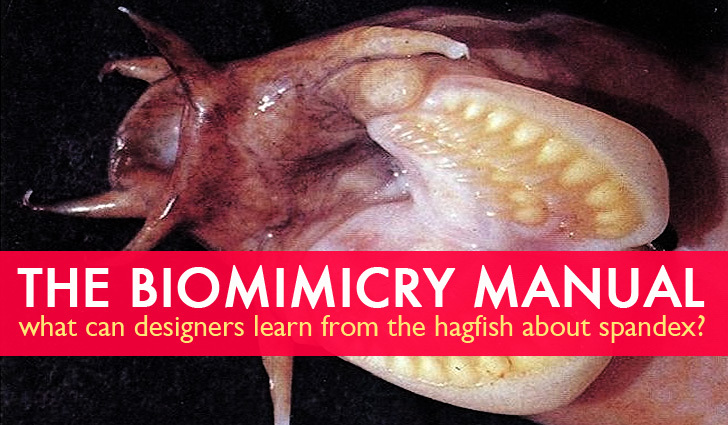 The Biomimicry Manual: What Can Designers Learn from the Hagfish About Spandex? The Hagfish is a jawless, spineless horror, scavenging the ocean floor. Unchanged for the past 300 million years, this living fossil wields a fiendishly effective defense. When attacked, it exudes an ooze that bloats to hideous proportions, thickly coating the enemy in an inescapable cocoon. Following the predator’s final death-gasp, the hagfish ties himself in an overhand knot, and works his way out, head to tail, squeegee-ing down the slime as he goes. Can we learn something from this treacherous mucus? Find out today in The Biomimicry Manual. The eel-like Hagfish is a primitive, paddle-tailed creature, with lensless eyespots and no true fins. His jawless skull is cartilage instead of bone, and he gracelessly yanks off bites of carrion with a pair of horny, comb-like projections on a cartilaginous plate. Not your favorite relative perhaps, but recent DNA evidence suggests his ancestors preceded the evolution of the vertebrate spine. Hagfish have stuck around through just about everything, outlasting dinosaurs and many mass extinctions. They know what they’re doing—which is mainly gobbling polychaete marine worms on the deep, dark ocean floor, and eviscerating the bodies of their favorite food: dead and dying cetaceans that they devour from the inside out. How do they get in? They use their bizarre overhand-knot behavior “in reverse” to leverage off chunks of flesh, excavating their way into the body cavity. Once inside, the living is easy. Hagfish can absorb dissolved organic matter right through their skin and gills. Their skin has other mystical properties. One hundred ‘invaginations’ run down its sides, each chock-full of glands. These exude two components: slime thread fibers, and mucin vesicles. Together, they interact to create hundreds of miles of magical, milky white, microfibrous ooze. Each two-inch fiber reinforces this slime and allows it to stretch without breaking. Oh, but won’t these threads tangle horribly, you say? Not a bit. The ever-crafty hagfish squirts them out like nautical rope, stacking them into tightly wound figure-eight coils. When this complex goo hits seawater, the ‘rope’ unwinds, and the mucin vesicles swell and pop, attaching to the rope to create over 5 gallons of super-strong, stretchy, and impossibly sticky Jell-O. Tim Winegard, at the University of Guelph in Canada, is researching the properties and applications of hagfish slime as a renewable alternative to petroleum-derived synthetics like nylon, lycra, or spandex. Structurally, the stuff is somewhat similar to spider silk, but with proteins that are far smaller and easier to copy, and even (theoretically) to produce with genetically-engineered bacteria. And, if that doesn’t appeal, then we can also just eat it. Most people don’t, because hagfish is, you know, just plain gross. 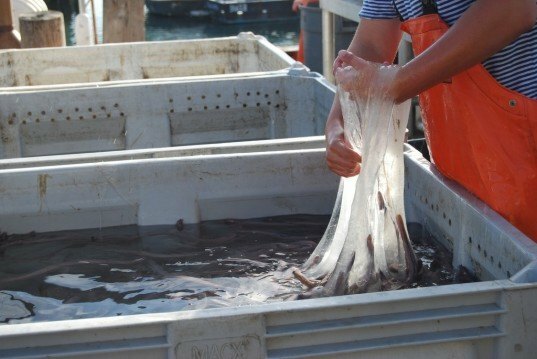 But in Korea, I am told that hagfish are kept alive in containers, and you simply bang the cage with a stick when you want to whip up a quick hagfish-slime omelette. Delicious. Absolutely! Let's get rid of all that stuff. If I was DuPont, 3M, DARPA... I'd be all over this stuff. The hagfish could potentially be a solution to the problem of microplastic pollution! 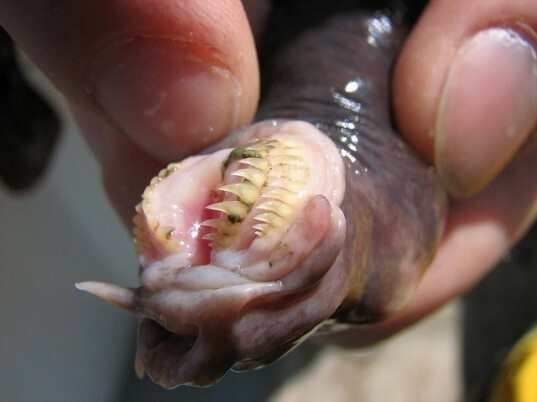 The Hagfish is a jawless, spineless horror, scavenging the ocean floor. Unchanged for the past 300 million years, this living fossil wields a fiendishly effective defense. When attacked, it exudes an ooze that bloats to hideous proportions, thickly coating the enemy in an inescapable cocoon. Following the predator's final death-gasp, the hagfish ties himself in an overhand knot, and works his way out, head to tail, squeegee-ing down the slime as he goes. Can we learn something from this treacherous mucus? Find out today in The Biomimicry Manual.